What can you do for your beloved one who already passed away? Praying, memorial service, visiting the cemetery with flower....Although there are many kinds of religions in the world, there are not many you can do for the deceased. I believe our Toro Nagashi ceremony is one of "not many things" you can do for your beloved ones. 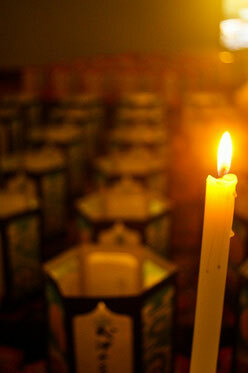 Dedication of lantern is an expression that you are thinking of the deceased. Lanterns are actually gifts to the deceased from the various sponsors. But at the same time, lanterns are gifts to you from the deceased, too. Because it is you who can appreciate the lanterns with light. Lanterns with light are so beautiful, I think, because they are reflections of something we all have in our hearts. Our Lanterns ceremony is being held tomorrow starting around 7:30 p.m.
We are not advertizing this ceremony because space of lanterns is always limited. But you are welcome to come to the ceremony at Kukuiula Boat Harbor Park. Please drive carefully around the park.